It's been five years, but I remain conflicted about how much I loved "Lincoln". I think Daniel Day Lewis' performance might be one of the most astonishing things acted on film. The politics, the actual story of how slavery was ended, are fascinating as well as important, never mind the value of seeing an actual hero of a great leader (nothing "anti" about him) on a big screen. I think "Angels in America", Pulitzer award-winning playwright Tony Kushner's writing is as good as it gets. And as per any Spielberg production since about 1993, the cast is so stacked that just watching legends like James Spader and Tommy Lee Jones perform against one other is its own pure pleasure. But even with that stellar film, as a director friend who knows more about movies than I ever will, and whose taste is far more selective and high-brow than mine said of the movie, "I kind of wanted more war." In other words, the flick was so bogged-down with backroom politicking it was a bit dry. Then came "Bridge of Spies". I liked this film a lot but I didn't love it. A close friend in a creative industry texted me back the other day when I asked his opinion. "Yes. Good film." Then I asked him to grade it out of then. To make a point. "I'd have to watch it again." He texted. "I don't even remember it." He added. "Lol." Which is, right there, my Steven Spielberg problem. Not the laughing, but the not remembering. A problem, to be more precise, related to "late" Spielberg. The early classics ("Jaws", "Raiders", "E.T.") are so filled with energy, enthusiasm and energy .. well who has a problem with those? What's prompted my writing this is my disappointment after watching his latest, "The Post", a movie I was yet again so ready to love. Like a favourite standup comedian you're already laughing with before they've made their first joke. The cast is of course so ridiculously A-list that Tom Hanks and Meryl Streep finally in a movie together aside, even the fairly itty bitty parts are played by some of the biggest names in Hollywood (I'm thinking of the main dude in "The Americans"). Tony Award winners, the best of the New York stage, they're all there. 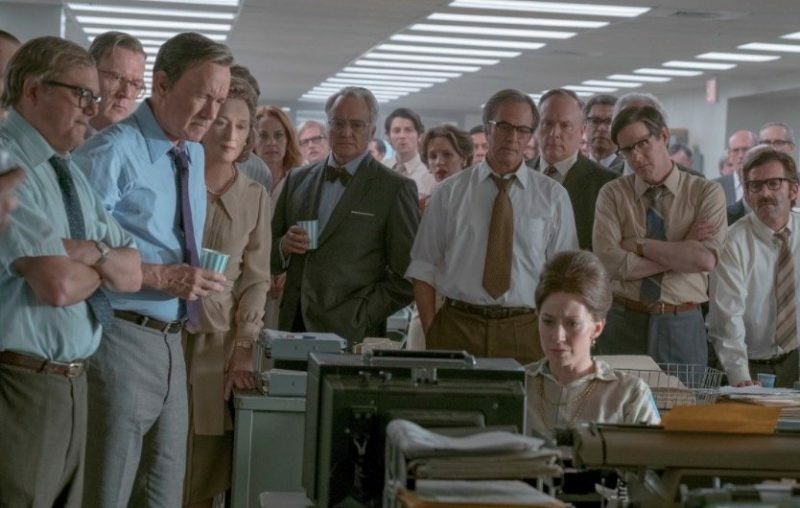 And obviously a story about journalists defending a free press against a vindictive American president trying to prevent truths coming out that would make him look bad is about as topical as a movie could get right now. Hence Spielberg putting on hold the CGI festival of a tentpole blockbuster he was working on this past spring ("Ready Player One") to quickly put this puppy together. So what's my problem? Once again, craft and a top-shelf cast and the rest just don't make up for the fact that I believe that Steven has lost his mojo. He doesn't have the juice he once had. In fairness, the great director has been at it for over forty years and has had how many resurgences? "Jaws" came out in '75. "Raiders" and "E.T." came out in '81 and '82. Things take a pretty serious dip in the late 80s with movies like "Always". Then there was "Hook" which is pretty universally panned. But you note that two years later "Jurassic Park" and Schindler's" are both released in the same year ... I mean, c'mon! Less than a decade later, again in a single year! (2002), he makes two equally incongruous films, but both stand the test of time, "Minority Report" and "Catch Me If You Can", the second of which is for me pretty much a classic it's so note-perfect in tone, cast, John Williams score and story story story. Three years later Spielberg teams up with Tony Kushner for the first time to make "Munich", which I consider a masterpiece: it is every ounce of the craft one of the all-time most skilled craftspersons in film history has ever wielded, with a story so full of punch, and enough passion and tension, to keep even its most intellectual debates (of which there are quite a few) exciting. Ever since, however, it's been downhill. I keep getting pulled back into the theatre because of what this man's name means. Like the way I used to go and see every 1990s piece of junk Robert DeNiro starred in because he was ... Robert De Niro (It wasn't all "Goodfellas" let me tell you. "Night and the City", anyone? ), I've been going to see Spielberg's movies because I know I'll be in the hands of a master storyteller. What's more, this is that rarest of Hollywood helmpersons who not only can tell a story, but he can tell it visually, and with a moral compass. He's come to be a guy who has something weighty to say, but can still say it whilst making you reach for the popcorn, and using the full width of a big screen to boot. Or at least he did. "The Post" is good. It's probably quite a bit better than that. But it's just ... it's just so well-crafted and taut (a new skill for Spielberg, as it happens) and kind of too perfectly put together (some unfortunate false sentimental notes aside). My point though is that it's missing the spark. It doesn't have the inspiration. It was made for all the right pro-journalist, pro-free speech, anti-authoritarian (anti -Donald Trumpirarian, which is to say modern-day Republican) reasons. And my downtown Toronto audience cheered for all those obvious reasons. But at the of the day, craft without heart ain't art. And I'm hard-pressed to believe we'll remember it a few years down the road.